This is a Planner, NOT a Journal . . .
One of my favorite quotes is Nietzsche’s comment: “A man’s maturity: that is to have rediscovered the seriousness he possessed as a child at play.” As planners, that’s what we do, right? We are serious about our planners, but truth be told we are lost in our world of play when we dive into a planning sesh. My name is Sylvia, and I’m a planner-holic. I must have an EDC calendar with monthly and weekly spreads, in a variety of binders or traveler’s notebooks, complete with stickers, washi, sticky notes, occasional bling, and gel pen. But journaling is my passion. I am a journalist—not the kind who reports on all the bad news (although there is certainly some of that), but the kind who journals regularly: questions, worries, explorations, memories, dreams, ramblings, rants, meanderings, ideas, observations, “freak out and throw stuff” venting—you get the idea. Journaling is like breathing–I need it like I need air. My lungs expand, and my brain oxygenates. Magic happens when pen hits paper. The magic is validation, affirmation, clarification, imagination. My thoughts, feelings, conjectures, ruminations are free to grow and roam. The paper receives them, God sees them. They jump off the page, stars in the night. And most nights hubby and I relax on the couch, chatting and watching TV. Our latest? Catching up on Lost. Critically acclaimed and involving time travel, he’s hooked; I, on the other hand, or rather, on the other side of the couch (by the lamp), am lost on my own island. “You’re just hanging with me, right? You’re not really watching?” he says. Another explosion?! Why are all the pregnant women dying? Rose’s brain goes one way, Bernard’s goes another. Sun speaks English, Jin not so much, but they communicate just fine. And so do my planner and journal. So I work full-time, and my planner comes with. Sometimes personal appointments affect work, and vice versa. I may need to make a phone call, and have that information in my planner. I may remember something I need to do or buy, and quickly jot it down. Or . . . it may be a really important idea. You know, just as important as Charlie’s message that he writes on his hand, “Not Penny’s boat.” Well, almost. Ideas come unbidden, fleetingly. Ideas are fickle and don’t obey my commands to appear when I am ready. They appear when they are ready. If I don’t write them down, they fly away like one of those Dharma hy-birds. And that’s where my Notes section in my planner comes in: it’s my idea log, my memory jogger, and my prompt feed for journaling. For example, I hear some great stuff regularly from students and co-workers. One day, in a deep discussion on reason and faith, a co-worker offers this little gem by G. K. Chesterton: “The madman is not the man who has lost his reason. He is the man who has lost everything except his reason.” Wow. That opened the hatch in my brain, releasing all sorts of electromagnetic sparks–and I had to write it down. I immediately thought of Nietzsche, the brilliant philosopher, and intellectual (and poet) who uttered those words on the importance of play, and who died tragically, in an insane asylum where he lived the last decade of his life. I didn’t fully grasp the quote’s meaning at the moment, of course, but that’s ok—I would later when my planner communicated with my journal and I had more time to think. Another time I shared some posts on my son’s IG account, _party of two; he and his girlfriend post beautiful pictures of exotic dishes and reviews of NY eateries. I was tickled by the response of my co-workers, and now we all want to try chicken and waffles, huevos divorciados, and Sri Lankan cuisine—well, maybe. These are moments I want to remember and capture in my journal, so for the moment, I do a quick jot in my planner as a memory jog for later. Would I be able to journal without my planner? Of course, but after a long day at work followed by daily home routines, when I sit down on that couch to watch Lost, I find that those stories and images are . . . lost! I can rescue them from that island deep in my tired brain, but the notes in my planner truly keep them all afloat. 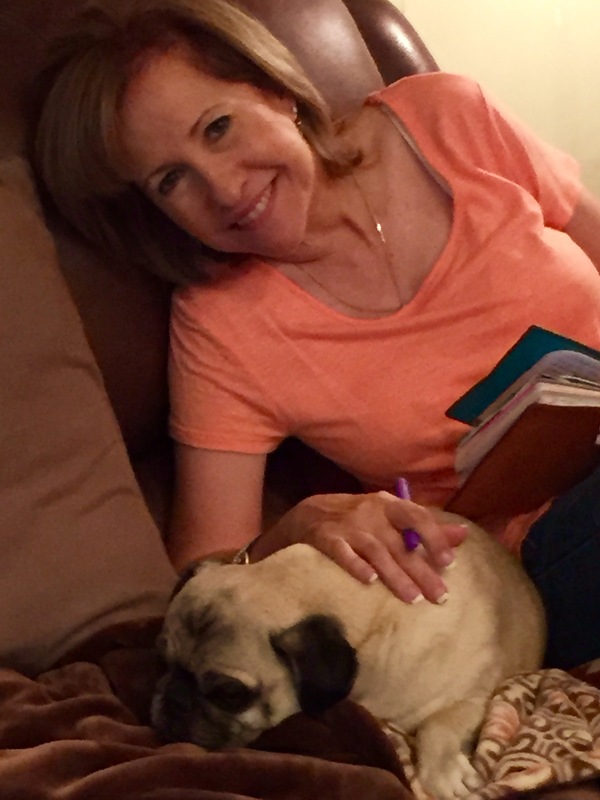 Journaling is a joy, not a duty, and I find that when I think I am too tired or don’t have time, that is when I most benefit from this refreshing blessing. Be serious about your fun, and play regularly: “If we don’t take time to play, we face a joyless life of rigidity, lacking in creativity. The opposite of play isn’t work, but depression. If we’re going to adapt to changing economic and personal circumstances the way that nature armed us to do, then we have to find ourselves having some play time virtually every day” (Play: How It Shapes the Brain, Opens the Imagination and Invigorates the Soul by Stuart Brown and Christopher Vaughan, quoted in Creativity at Work. Sylvia Vega is an educator at a community college. She lives in Arizona with her husband, Carlos, and Muggles, the magical pug. The Vegas are the proud parental units of two boys, both currently pursuing their dreams in digital media, writing, improv & stand-up comedy in New York City. Sylvia relishes time with her journals, great literature, and Scripture, while Carlos continues his relentless search for 5-star shows on Netflix and amazon. They anxiously await the next episode of The Americans. What a lovely article! You really clarified how both planners and journals can work together. I am new to hobonichi journaling and often I don’t have much to write because I can’t remember what happened during the day (especially if I get behind). I am going to try some of your suggestions as to how to use my planner more, to support my journaling. Thank you! Thanks so much, Lisa! I definitely can’t remember without planner help 🙂 I’d love to hear how you use your Hobo–I use it, too, but for a collection of sorts. I just “discovered” this magazine via Philofaxy’s Saturday post, and your title caught my eye. I love how you captured the whole experience of journalling and the way your ideas coalesce and link to other ideas or thoughts you’ve had at a different time of the day–or week. Your article reinforces why I journal every day. Loved reading your article–thank you! Great article. I hope to start journalling and art journalling more meaningfully now. I have come to it by the combination of using a paper planner and having more free time in retirement.